The Asia Pacific Superyachts team in Langkawi is pleased to announce the move to new APS fully staffed offices at the Royal Langkawi Yacht Club (RLYC) along with new APS team members joining Captain Charles Dwyer. Captain Charlie adds, “Asia Pacific Superyachts is acting as the agent for yachts over 30 meters for RLYC. The exclusive establishment, with a beautiful marina situated on the mystical island of duty-free Langkawi, has added new berths in and an extraordinary renovation and expansion of the entire marina.” Walker notes, “Our facilities include in office storage for visiting yachts pre-shipments to be kept on site for easy transfer to the yachts on arrival”. The increased member APS Langkawi team is excited with the move to the new spacious and perfectly located APS offices at the multi-million dollar renovated and enhanced Royal Langkawi Yacht Club & Marina, located on the south-east of Langkawi, close to Kuah, the main town and the island’s jetty point for ferries between the mainland and Langkawi. The location provides easy access for yacht crew and visitors to shopping, dining, entertainment, sports, transport and other businesses. The offices of Immigration and Customs are also within walking distance from the marina. The Club and Marina were designed and built to blend into the natural coast line and landscape of the island. Its imposing yet elegant structure is shaped to resemble a ship’s hull pointing towards the open sea and houses the main clubhouse. Captain Charlie comments, “Since its opening in 1996 the Royal Langkawi Yacht Club has positioned itself at the forefront of the rebirth of boating in Malaysia, growing in tandem with the island’s development to emerge as the heart of sailing and yachting on Peninsular Malaysia’s north-west coast”. 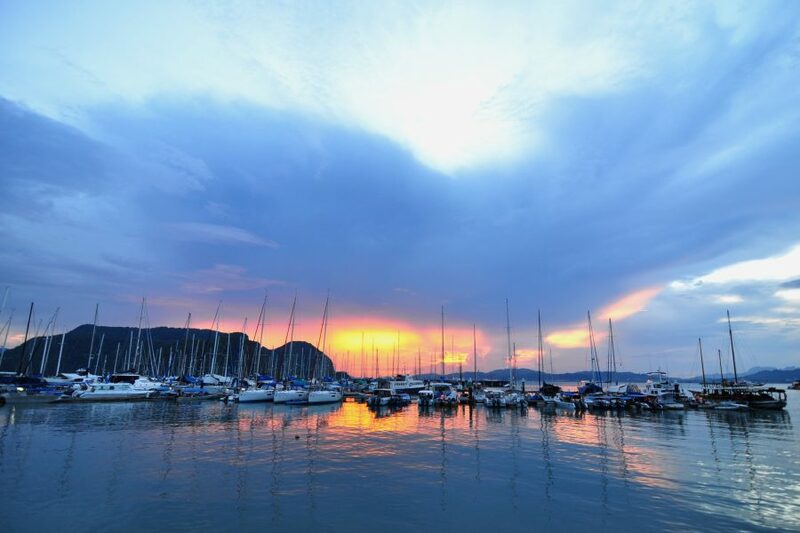 The Langkawi marina upgrading and expansion includes 6-berths to accommodate superyachts; 4-berths for 60-70 meter Superyachts and 2-berths for 80-90 meter Superyachts. The Superyacht berths are fitted with power pedestals of 400Amps for the 80-meter berths and 250Amps for the 60-meter berths.